The basic facts were as follows: two undercover officers “approached a legally parked vehicle in which sat three males. The vehicle was ‘consumed with smoke’ and condensation had formed on the rear windshield. The defendant was seated in the front passenger seat. As the officers approached the vehicle, the defendant opened the door and stepped outside. Smoke emanated from the vehicle, and the officers were struck by a ‘strong’ odor of burnt marijuana. One of the officers [Beliveau] … ordered the defendant to get back inside the vehicle…. ‘[I]n the passenger compartment of th[e] door’ [adjacent to the defendant] Beliveau … observed … a copper grinder (commonly used to break up marijuana so that it could be more easily rolled into cigarettes), and cigar wrappers. ‘[G]reen leafy matter’ was observed inside the grinder. The defendant appeared very nervous…. Beliveau asked the passenger [in the back seat] and the defendant for identification” and questioned them about their contact with the criminal justice system. “The passenger responded that he had been arrested for a firearm charge and was on probation…. The defendant responded that he had been arrested…. At that point, which was approximately four minutes from the time the officers approached the vehicle, Beliveau’s partner called for back up. Meanwhile, a woman started approaching the vehicle and asked the officers what was going on…. [T]he defendant identified her as his mother. Within a few minutes, two [other] officers arrived[,] [o]ne of [whom] positioned himself near the defendant.” Beliveau’s partner began a computer check of the defendant’s information and Beliveau began pat frisking the passenger. At that point, “which was seven to eight minutes after Beliveau and his partner first approached the vehicle, the defendant fled. Three officers chased after” him. “The officers yelled for the defendant to stop, but he kept running” and eventually entered the side door of a building forty or fifty feet away, “which was later determined to be his residence. He entered the residence without the use of force or a key. The officers followed the defendant into the residence…. [T]he officers tackled [the defendant]. Once on the ground, without giving the defendant any Miranda warnings, one of the officers asked the defendant why he had run. The defendant responded that ‘he had a firearm’ in his front right pocket. The police retrieved the gun” and arrested the defendant. After he was charged with firearm offenses and a related offense, the defendant moved unsuccessfully to suppress the gun and other evidence. At trial, he was found guilty of two firearm offenses. On appeal, he challenged the denial of his motion to suppress. In its decision ordering suppression, the Appeals Court made two preliminary rulings prior to its dispositive ruling on the officers’ hot pursuit of the defendant into his residence. First, the Court rejected the defendant’s contention that the initial seizure — when Beliveau ordered the defendant to get back into the car — was unconstitutional. “While the defendant correctly asserts that there was no reasonable suspicion for his possession of a criminal amount of marijuana, there was overwhelming evidence of civil marijuana possession,” i.e., the plume of smoke and the odor of marijuana. 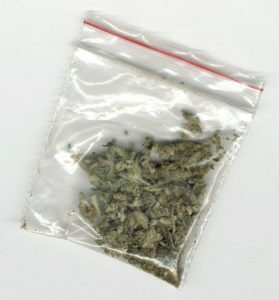 “Accordingly, the police could lawfully detain the defendant long enough to issue a citation and confiscate the marijuana.” The Court’s second preliminary ruling rejected the defendant’s contention “that the length and nature of the stop was longer and more intrusive than necessary for the issuance of a civil citation” for marijuana possession. The Court stated that although Beliveau engaged the defendant and the passenger in a series of questions unrelated to the issuance of a citation for marjuana possession, the questioning did not “result in unreasonable delay” where it “produced no incriminating evidence and was brief.” Turning “to the chase [in hot pursuit] that led to the warrantless entry into the residence,” the Court noted that “[t]he Commonwealth [bore] the ‘heavy burden,’ in the absence of consent, of justifying a warrantless entry by establishing both probable cause [to believe that a jailable crime was committed] and exigent circumstances. [Commonwealth v.] Jewett, [471 Mass. 624,] 628 .” Here, stated the Court, the Commonwealth failed to establish either probable cause or exigency. Despite the fact that the citizens of Massachusetts voted possession of less than an ounce of marijuana into a civil infraction, law enforcement continually attempts to use such possession as a basis for stopping and searching individuals. If you or a loved one is charged with a criminal offense that arose after police officers attempted to detain or search you in relation to possession of less than an ounce of marijuana, you will need a skilled attorney to make the appropriate arguments to the court on your behalf. Attorney Daniel Cappetta is such an attorney – he has successfully raised such arguments for his clients numerous times. Put his expertise to wok for you and call him for a free consultation today.